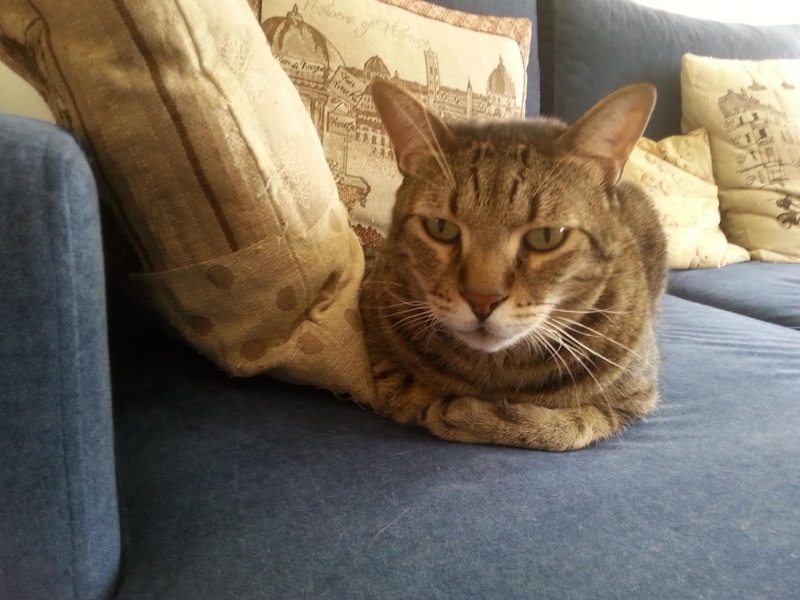 Caspurr the Courageous here, King of the Tigger-Tabbies, and Commander-in-Chief of the Impurrial Forces. 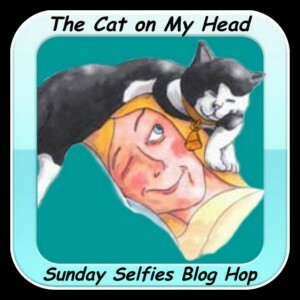 We are going to participate - for only the second time - in the Sunday Selfies Blog Hop hosted by The Cat On My Head. Since we are still fairly new to this whole blog hopping business, and Our Human still doesn't have a clue what She is doing We are still on a learning curve, this will probably take Her Us an hour to do what effuryone else manages to do in ten minutes, but We are sure that eventually, Purractice will make Purrfect. Trixie was the fursst of Us to attempt a Blog Hop a few weeks ago, so, it is now My Turn. And here I am - as Large as Life and Twice as Natural (mol). I am not one to blow my own shofar trumpet but be honest - did you effur see such a Handsome Mancat as myself? Now, as I said, technically it is My Turn today to star in the Blog Hop. However, since Rosh Hashana (the Jewish Mew Year) starts tonight, my fursibs, Trixie and Shimshi also wanted to get in on the picture, as it were and wish you all Shana Tova - A Happy Mew Year. So here is a picture of all three of Us - and of Flat Moo, who is visiting Us, as part of her World Tour (see purrevious Posts), relaxing on the sofa so as to be well-rested for tonight's Rosh Hashana Feast (to which, of course, all Our Furriends are invited, as usual) which will be at 8 pm Israel time, up at (where else?) the Enchanted Forest. Have a wonderful Mew Year, Shana Tova! May it be a Year full of Love, Fun, Mischiefs, plenty of Fancy Feasties and Catnip too! May it be a year in which effurry homeless kitty finds someone to care for them, a year in which effurry shelter kitty finds his or her furever home! 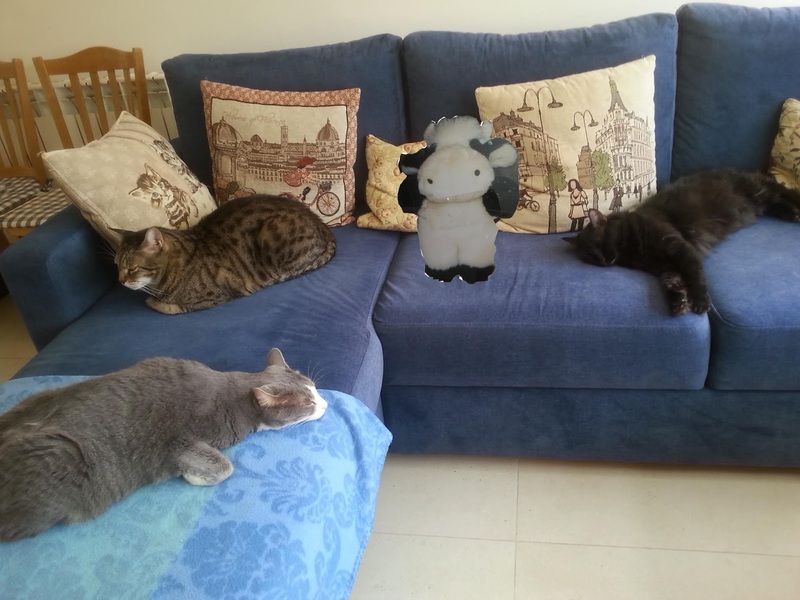 Trixie, Caspurr, Shimshi, Mummy Shimona and #MooToo. Happy New Year wishes to you all, Moo included! I have to say that you did very well for your second selfie and that you look quite the ruling chief with just the right amount of dignity and composure. Practice makes perfect, so we hopes to see you next week, too! Good job on the selfie. You have wonderful New Year wishes. I hope your year is joyful. May the coming year be a good & sweet year for all of you there. It is 6:30 pm here & I should be @ the Cemetary for the service but I couldn't face it (or the curious people asking me about P SH). I just don't feel very Jewish or Mewish right now....may G-D forgive me! L'Shana Tova, dear friends. Wishing you a happy and sweet new year! You are indeed very handsome! We dont quite understand the blog-hops either. We tried it a couple times, and we think it worked. But we're not sure why.